A Maine Wastewater Treatment Plant has undertaken a $15 million facility upgrade including: new construction of grit and septage buildings, an oxidation ditch, secondary clarifiers, solids handling building, and sludge storage tanks. With an anticipated duration of two to three years, the plant will have the capacity to handle flows of 4 to 12 MGD. Pizzagalli Construction Company of South Portland, Maine, contacted Godwin's New England rental office for pumps to bypass the main flow during the upgrades. 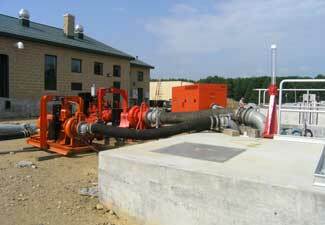 Godwin recommended two 8-inch CD225M Dri-Prime pumps and one 12-inch DPC300 Dri-Prime pump. One CD225M electric drive pump functioned as the primary unit, handling flows from 2 to 3 MGD and the other CD225M pump, a Critically Silenced sound attenuated unit, functioned as a secondary pump. The DPC300 pump was onsite as a standby to handle storm flows up to 6 MGD. 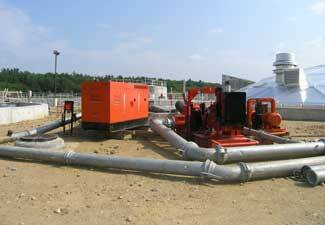 Pizzagalli set the pumps in place, and Godwin fused 400 feet of 18-inch HDPE discharge pipe on site. Pizzagalli also rented a pump for about a month for sludge removal. The bypass part of the upgrade wrapped up at the end of July after two months on rent.